In the world of e-commerce, Magento is king. Lauded as “the leading e-commerce platform provider,” Magento is the front runner for businesses looking to reach their online customers. However, with the current acceleration of the smartphone and their apps, a new buying phenomena has emerged, Mobile Commerce, or m-commerce. M-commerce can be defined as the process of conducting commerce by transferring ownership of goods or services via a mobile device. With the exponential growth of m-commerce, it is imperative your products be available for purchase at your customers’ fingertips 24/7. While your competitors fight for market share in e-commerce, your brand can get a leg up on the competition using Magento for Mobile. Your customers and potential customers may not always be near a computer, but they will always be near their phones. 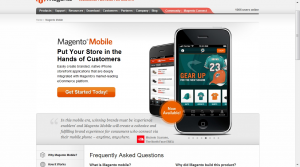 In just a few easy steps, you can leverage m-commerce using Magento themes for Mobile. It comes at an extremely reasonable monthly fee, with the option for full technical management by Magento. So while you focus on profit, Magento will ensure uptime. Designing native apps can be very expensive, while their maintenance can be tedious and exasperating. Fully customizable and hassle free, position your m-commerce debut for maximum success with Magento for Mobile.